Bettina Hoy (GER), competing at her 10th FEI European Eventing Championships, set the standard for the rest of the field with a flawless display of dressage and has now set up a commanding lead after the first day’s competition at Strzegom (POL). 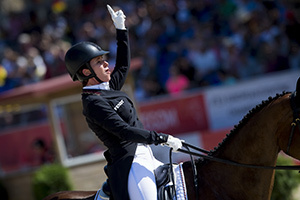 Hoy, 54, who took the title 20 years ago with Watermill Stream at Burghley (GBR), scored two 10s for her riding and set a European Championship record with her mark of 24.6 penalties which will significantly boost Germany’s chances of a fourth successive team gold. “’Micky’ is a pleasure to ride, which makes my job easier. The team is feeling very positive. We are lucky to have such a good system of training riders in Germany and we all motivate each other,” Bettina Hoy (GER), current Dressage leader. The defending champions are well ahead at this early stage, with Luhmühlen winner Julia Krajewski, who takes the team pathfinder role for the first time, in third place on her brilliant little Selle Francais gelding Samourai du Thot with a score of 36.3. Thomas Carlile of France had the unenviable job of following Hoy into the arena, but he is currently in second place on 34.4 penalties with the impeccably behaved nine-year-old grey stallion Upsilon, already the sire of around 380 foals. “Bettina is a super rider to watch. I expected to be behind her, but perhaps not quite so far behind! Upsilon is mature for his age and very precise, so I was able to put the pressure on myself, but in a good way,” Thomas Carlile (FRA), currently in second place. The atmospheric arena at Strzegom has brought out the best in others too, as three more combinations have scored below 40 penalties. Swiss team member Felix Vogg, who works part time for his father’s real estate company, is in fourth place with Onfire with 37.2; Sweden’s Louise Svensson-Jahde (Wieloch’s Utah Sun) is fifth and Ros Canter (GBR), making her senior team debut, is sixth on Allstar B with a personal best of 38.6. Defending champion Michael Jung’s (GER) pupil Pawel Spisak, a member of the host team, Poland, is currently 11th on the former racehorse Banderas with the excellent score of 43.4. Jung goes shortly after 15.30 tomorrow afternoon with the mare fischerRocana.